My oldest son, Cal, is an extraordinary big brother. He has such a big heart and on most days he leads his little brothers so well. He also though, like his mama, has a very competitive spirit and one day- in the summer of 2011- it got the best of him. And then it happened. From the kitchen window, I watched Cal lunge at his little brother in anger. I threw myself into the middle of the battle, physically pulled Cal off of Brennan, and before I knew it, words of shame shot out of my mouth and straight into my son’s heart. With our arms wrapped around each other we prayed and I assured him that though we are going to say and do sinful things every day, his identity is immovable in Christ. He is a sinner saved by grace- but he is, at the very same time, a perfectly and wonderfully made child of God who is loved and accepted beyond measure. Cal and I wiped our tears away, and do you know what he did next? He went right to his brother and sought forgiveness. I didn’t have to tell him what to do. His heart was convicted and broken and healed by the gospel too. That was almost four years ago. 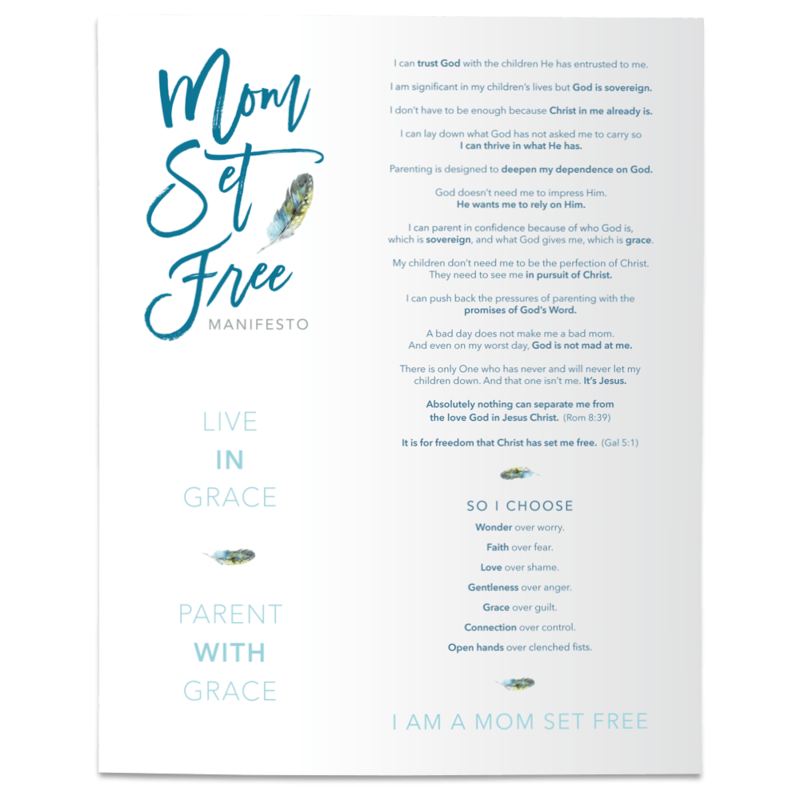 And I am still learning how to weave grace into my parenting. But this much I know to be true……. If I had paused just long enough to put the cross between Cal and me, to remember my own daily sin and need for the cross as I saw my son’s sin and need for the cross in that moment - my response would have looked so different. I would have remembered that Cal's actions required correction, not condemnation. [Tweet "Putting the cross between us transforms our message of “How could you?” into “Me too.”"] The cross of Christ overcomes shame with grace. Shame fosters our children’s feelings of being unworthy of love and acceptance, and creates hopelessness in their hearts. Shame tells them they will never be good enough. But grace! Grace inspires HOPE. Grace affirms that, because of Jesus, there is absolutely nothing that can make us unlovable to God. Grace affirms that Christ was enough for us. So often we chase after an immediate behavioral response from our kids when what we really want is long term transforming heart response. And transforming heart response is only accomplished through the cross. The cross is the ultimate act of love that kindles and inspires our love for God and a desire to obey His word. Putting the cross between us- seeing our children through the lens of the self-giving love of Christ- transforms our experience with our children. It allows us to remember our own need for grace and come alongside our kids in their weakness rather than down on them. There is such a profound difference in the two, and which one we choose will radically impact our relationship with our kids. So as we enter into the Lenten season, I want you to know I'm praying we will be ever mindful to keep our eyes on Jesus and remember with a new tenderness what He's done for us. And I’m praying we will be empowered by His Spirit to keep the cross between us and our children, and experience the fullness of His wild grace in the way we lead and love them. I'd love for you to join me in that prayer.